See the world come alive through Meera Lee Patel's vibrant map. 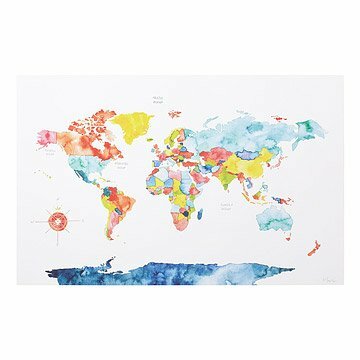 Countries pop with dreamy washes of watercolor painting and ink, providing an eye-popping global perspective in any space that sparks your imagination. Print made on recycled paper in Brooklyn, New York. Meera Lee Patel is a self-taught artist raised by the New Jersey shore, where she swam the bright waters and climbed cherry blossom trees until she grew old enough to draw them. Her illustrations are inspired by the magical mysteries of nature, the quiet stories that lace through everyday life, and the bold colors of her native India. Meera lives and works in Brooklyn, New York. We all want a fun,easy way to know world geography and this will be a beautiful way to do it. Such a pretty map of the world. I love the colors used, they are bright but delicate at the same time. Love the simplicity and aesthetics. I bought this piece of artwork a while ago but forgot to do a review. I love it so much, it brightens up my room cause it's boring. I would buy this as a gift for a friend/ family member. See the world come alive through this dreamy watercolor rendition of the world.